Tyrone Rucker was 14 the first time he went to juvenile hall, before he “graduated” to prison, as he puts it. It was the same age he first tried crack. Jackie Whitt was 14 when she became homeless and began learning how to steal cars to make money. Years later, both Rucker and Whitt live in Portland, clean for eight years and five years, respectively. Rucker works on the Integrated Health and Recovery team at Central City Concern, and Whitt is an electrician. Rucker, Whitt and eight other former inmates will share their stories Oct. 29 at First Unitarian Church of Portland as part of a project called “Shaping a Future: Life After Prison.” Their stories run the gamut of prison experiences, from extended stints in solitary confinement to racial segregation to prison guards’ abuse of power. Most of the stories, however varied, have a common thread: Prison does more harm than good. Carol Imani, the organizer of the project, has been a community college writing instructor in Portland and Klamath Falls for 25 years. Imani became interested in the impacts of incarceration because she has a family member who struggled with substance abuse and was involved in the criminal justice system. In 2015, she organized an event, funded by the Regional Arts and Culture Council, where family members of inmates or former inmates shared their stories. 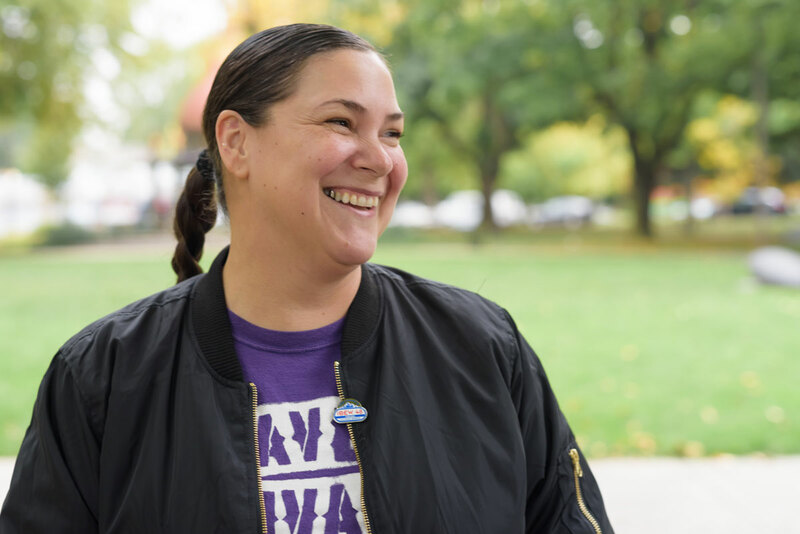 “Shaping a Future: Life After Prison” is her opportunity to continue creating a platform for people affected by the prison system and a space for them to build community with one another, this time focusing on the challenges of re-entry after prison. “I thought that’s something people generally don’t understand, that when you get out of prison, it’s difficult in a lot of ways,” Imani said. She facilitated five writing workshops with the 10 project participants. They had the chance to delve into their experiences with prison and re-entry and share them with others who have also gone through those challenges. The Oct. 29 event is an opportunity for the former inmates to share their experiences with a public audience, to “tell their stories without shame,” Imani said. And this is how Rucker and Whitt tell their stories of prison and re-entry – without shame, but with gratitude and with conviction. Rucker starts his story off at the age of 14, when he was first sent to juvenile detention and drugs began to consume his life, he said. Rucker grew up in Pasadena, Calif., as one of three boys, years apart from his older brothers, each from different fathers. Their mother was raising them on her own. By the time he was an adult, he was “homeless and broke,” smoking crack and sometimes meth, and in and out of jail and prison. “Never got any information, never heard about treatment or anything like that,” he said. Rucker never felt like prison was about rehabilitation, preparing him to succeed on the outside or helping him overcome his addiction. Jackie Whitt’s first day of her last prison term was the day she decided to get clean and sober. Whitt grew up in an environment surrounded by drugs, her mother a heroin user in and out of the criminal justice system. Whitt suffered neglect, physical abuse and sexual abuse –trauma that remained untreated for a long time. When Whitt was a youth, she and a group of friends whose parents all abused drugs vowed that they’d never touch hard drugs (anything beyond alcohol or marijuana) and that they would make it out. At age 14, her mother relapsed, and they lost their home. Whitt dropped out of school in the eighth grade, stealing cars to make a living. At age 19, she met the man who would become the father of her three children. Together they manufactured and distributed drugs, amassing wealth and assets together. Yet despite her criminality, she had until that point kept true to her promise to herself as a child and had never used hard drugs. She was enraged when she discovered that her partner was using cocaine. But eventually, he persuaded her to try it. “I was a dope fiend from that point forward,” Whitt said. A series of events, including betrayal from her partner, led her to become homeless. While living on the streets, she became involved with a man who physically abused her and introduced her to crack. Within nine months, she was in prison. According to the Center for Prisoner Health and Human Rights, about half of prison and jail inmates abuse or are dependent on substances, and over half meet the criteria for mental illness. It was during their last stints in prison that Rucker and Whitt decided to get clean and change the direction of their lives. For Rucker, it was a book shared with him by an inmate he wasn’t supposed to talk to. But one day, a white man approached Rucker, who is black, in the TV room on a day the black inmates had control of the TV. So when he received his $200 from the prison on his release date, he didn’t head to Skid Row and spend it on drugs, a backpack and a hygiene kit, like he usually did. Instead, he bought a ticket to Portland. In Portland, he became involved in Central City Concern’s recovery and mentor programs. “I went to treatment, I learned those tools, and everything started lining up,” he said. He got a job at Dollar Tree. Three months later, he was hired on call at Central City Concern, and he was promoted a year later. A year after that, he was hired on full time as a case manager at Transition Projects. In 2014, having housed the most people of any case manager, he won the Skidmore Prize, which Willamette Week awards to outstanding nonprofit workers. She became heavily involved in her spirituality and went to treatment. She stayed away from people that didn’t respect her boundaries, worked full time as an orderly, and attended church services and all the classes that she could. Yet she wasn’t allowed to finish her treatment program. “Their reasoning behind it was they felt I wasn’t going to stay clean,” she said. When she got out, she had 16 certificates of completion from different programs and classes. She took Rent Well classes, attended Mercy Corps re-entry programming, took vocational rehabilitation classes and accessed mental health services. She was able to keep her apartment, and she started family counseling with her children. “Since then, I’m crime free, domestic violence free, and my clean date is when I went to prison,” she said. Today, Whitt is part of the International Brotherhood of Electrical Workers Union Local 48. She is also a peer support specialist, and she lives with her children. Rucker, meanwhile, is working toward his Bachelor of Arts in health administration, owns a home in St. Helens and has custody of his young son. Both have felony status but have overcome many of the barriers that come with that. Yet they both agree that prison created more barriers than it removed. “It’s just so sad because the system is so built like that,” Rucker said. “It’s about money,” Whitt added. “Shaping a Future: Life After Prison” will give Rucker and Whitt the opportunity to shed light on the injustices they witnessed and experienced in the prison system. Imani hopes people in attendance will learn about these injustices, such as the lack of access to services, mandatory-minimum sentencing and the disproportion-ate imprisonment of people of color. “I want to challenge the community, that if they really want a better community, like I know they want a better community, they need to worry, and they need to care, and they need to ask questions,” Whitt said. “Like what’s happening to those people when they get to prison? What situations are they being put into, and what access do they have to get mental health help? Where: First Unitarian Church of Portland, 1211 SW Main St.